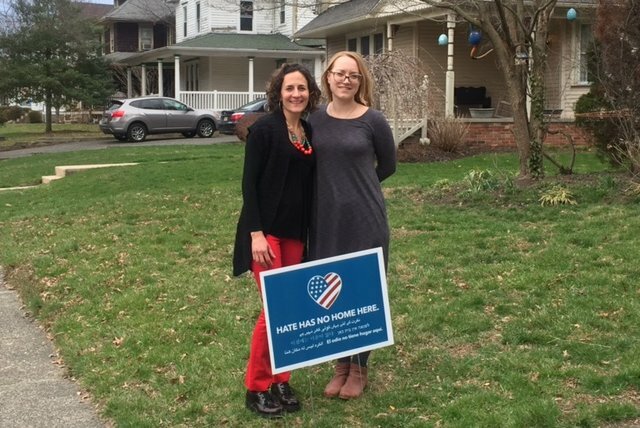 Friends and neighbors Daria Durand and Elise Smithmyer were appalled by Haddon Heights officials telling residents to remove "Hate has no home here" signs from their lawns because they violate a town ordinance. "I'm embarrassed for the town," said Durand. There's apparently no room for those "Hate has no home here" signs in Haddon Heights. The borough's part-time zoning officer, Ron Newell, issued an unknown number of notices Thursday, warning of fines if the signs are not removed within three days. Ronald Newell is the zoning officer in the town. And then he went home, leaving the borough clerk's office to field calls from annoyed residents. Clerk Kelly Santosusso said she's gotten a stream of angry calls. She referred callers to the town solicitor, Albert Olizi. The lawyer, hit with a bunch of calls, has told the city to hold off on enforcement of the sign regulation – for now. Olizi said the city has a rule requiring "temporary signs" to come down 21 days after going up, but he said he was not aware that notices were going out to residents. Olizi said he is unsure how many notices were issued or what the fines are. "We're going to take a look at this," said Olizi. "I see the signs as I drive around. I don't know what they say, but it all becomes political." Friends and neighbors Daria Durand and Elise Smithmyer each has a poster in front of their 9th Avenue homes. The social workers didn't get notices, but heard about them through friends, social media and news accounts. "I'm embarrassed for the town," said Durand, who is half Iranian and grew up in nearby Cherry Hill, accustomed to harassment and hate mail. Cherry Hill has embraced the signs, using them in a recent video supporting inclusivity. Smithmyer said the orders to remove the posters "sends a powerful message to the community that they don't have to be sensitive to what is going on. It seems inappropriate." In the aftermath of the presidential election, the "Hate has no home here" signs sprung up on lawns across the region as part of a national resistance to discrimination. The signs were originated in a Chicago neighborhood and the originators have said they have no political meaning and are simply a call for inclusivity. 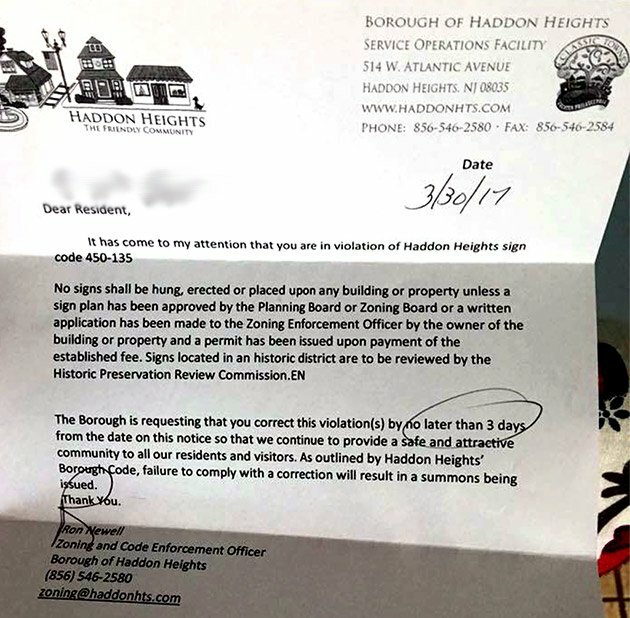 The borough's mayor, Jack Merryfield, said he was aware the violation letters were going out based on the zoning regulations limiting sign displays to 21 days, but he said reaction on Facebook implies there is politics involved. He said the sign ordinance is aimed at contractors who place signs and leave them. He was unsure of the amount of the fine because, typically, "People take them down when they get a notice." According to municipal ordinance, "temporary signs announcing or advertising any educational, charitable or religious event will be permitted, but in no event shall such temporary signs remain in place for a period exceeding 21 consecutive days in any calendar year, and in no event shall such signs exceed 24 square feet in size." Violation of the ordinance carries a maximum penalty of a $1,250 fine and 90 days in jail. "Haddon Heights: 'There's no room for hate here,' I believe that," said the mayor. "No disrespect was intended. It's what the ordinance says. I'm sure there will be an outcry at our next meeting and we'll take a look at it. The code official was not picking on anyone," Merryfield said.